The Daewoo KOR6AOR works well, and despite it's modest size offers pretty good value. Overall construction is good - the KOR6AOR feels sturdy to the touch. Power cable is 80cm long - may be too short for some users. The Daewoo KOR6AOR features a moderate 20 litre capacity, and is finished in an attractive black exterior, with a silver handle. Priced at around £60, it's quite a cheap microwave, and ideal for those on a budget. This solo microwave features a Dual wave microwave oven system, and 10 Different Power levels - with four different auto cook menus. This dual wave system helps to eliminate uncooked or cold areas, and in practice we found the Daewoo KOR6AOR to be efficient at both reheating and cooking. Although quite small in size, the KOR6AOR accommodates most larger plates and dishes, and should be ideal for those with a smaller kitchen or family. Please note that the power cable on the KOR6AOR microwave is approximately 80cm long, and as such may be unsuitable for those with no access to a close power socket. This shouldn't be an issue for the majority of users - however it will be worth checking prior to ordering. Externally the Daewoo KOR6AOR measures 44.6cm by 27.0cm by 33.2cm, which is pretty reasonable for a 20 litre solo microwave. The control system is button based, six of which are labelled with a symbol rather than a text label - so initially you may need to consult the instruction manual in order to operate the Daewoo KOR6AOR - our testers soon got the hang of it though. The rest of the controls are simple enough to understand, and none of our testers experienced any difficulties in operating this solo microwave. Overall the microwave performed well, and the Daewoo Eco friendly feature works well and helps to save power - this feature switches the Daewoo KOR6AOR microwave to a low energy mode upon a few minutes of inactivity, thus saving power and being more environmentally friendly. As you'd expect, the KOR6AOR also includes a child friendly design, with the locking system helping to prevent accidents. All in all the Daewoo KOR6AOR is a solid entry level microwave, which offers fairly basic functions, but performs them well. The black and silver colour scheme looks smart, and our testers were pleased with the microwave's performance, especially considering the low price tag. 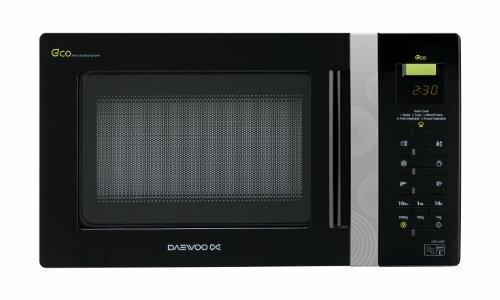 If you're looking to buy a new solo microwave, then the Daewoo KOR6AOR is well worth considering. 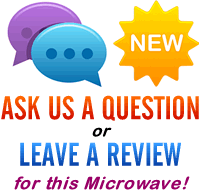 Overall the Daewoo KOR6AOR solo microwave offers very good value - reliable and cooks well. 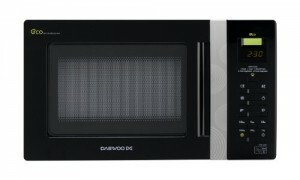 If you're looking for a cheap microwave, then the KOR6AOR microwave from Daewoo is worth looking at. It's not particularly flashy, but it proved to be reliable and carried out it's duties with ease. Essentially the KOR6AOR is a compact and fairly basic solo microwave which is available at a competitive price, and one which we'd recommend to our readers.